EAW022417 ENGLAND (1949). The area around St Bride's Church, London, 1949. This image was marked by Aerofilms Ltd for photo editing. 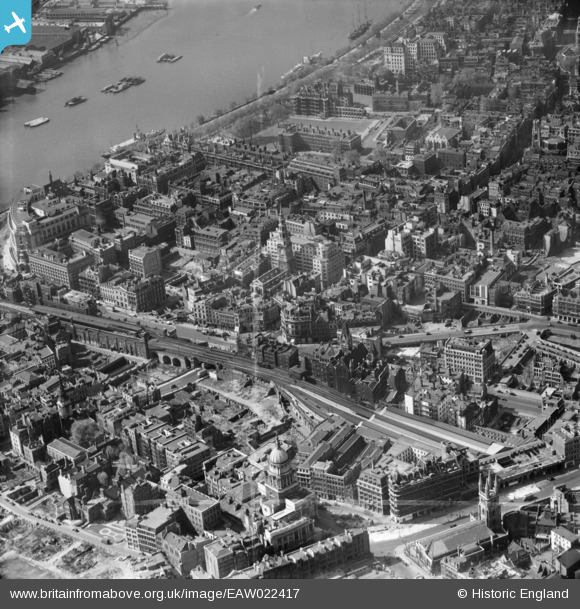 Pennawd [EAW022417] The area around St Bride's Church, London, 1949. This image was marked by Aerofilms Ltd for photo editing. Ludgate Hill Station, still standing despite closing on 3rd March 1929. It has now been demolished. The attached map is from 1951, and shows it with a "Disused" label to it.